Join Tanya Roberts for a fun workshop to get you started in thinking visually and drawing great comics! Tanya is an international comics artist best known for her work on Star Wars: The Clone Wars, Boom!’s Toy Story, Titan Comics’ How to Train Your Dragon, and Plagued: The Miranda Chronicles from BHP Comics. Award-winning writer Gary Chudleigh gives you the ultimate guide to creating characters and writing comics! He’ll take you through the dos and don’ts of creating believable characters as well as planning exciting plots for your first comic! Riso printing is quick, cheap, colourful and perfect for comics! Curious? Meet artist Gordon Shaw, whose comic Rick 4 launches at this year’s ECAF. Find out how to prepare your artwork for riso, and see just how easy the process can be! Banshee – An exhibition by Out of the Blueprint resident artists Eli Spencer and Sophie Robin. The artists will be showcasing their new publication, with signed copies and exclusive merch available. Launch of the Blueprint 12! The ink’s barely dry! We’re celebrating twelve new comics from young zinesters and comic makers from across Scotland, debuting at this year Comic Art Festival! Available from the Blueprint stall. On Sunday 25th we’ll be bringing you the best in indie comics! We’re open to all and all our events are totally free! ECAF is part of Book Week Scotland and promotes comics and reading for everyone. ECAF aims to be a safe and inclusive environment for our community and we work to ensure everyone has a great time at our events. We’re excited to return to Edinburgh’s Drill Hall next week as part of Book Week Scotland! We’ll have loads of great creators, bringing you comics, illustrations and art. It’s a good time to kickstart the Christmas shopping in style or join in one of our many FREE workshops! Exhibitors include Panels Comics, Umpteen Press, Roller Grrrls and Zhou Fang Comics. There’s something for everyone! Edinburgh Comic Art Festival, 25th November, 11am-4pm at Leith’s Drill Hall, part of Book Week Scotland. We’re really excited to host ECAF at The Principal hotel as part of Edinburgh International Book Festival, with 50 exhibiting authors there will be lots to see. Ranging from Scottish favourites, Neil Slorance (The National), Monty Nero (The Hulk), Metaphrog (The Little Mermaid), Tanya Roberts (Star Wars) to emerging talents like Kathryn Briggs, Eve Greenwood, Dave Cook and Zhao Fang. There is something for everyones tastes to suit all readers. We’re so pleased to be part of Edinburgh International Book Festival. 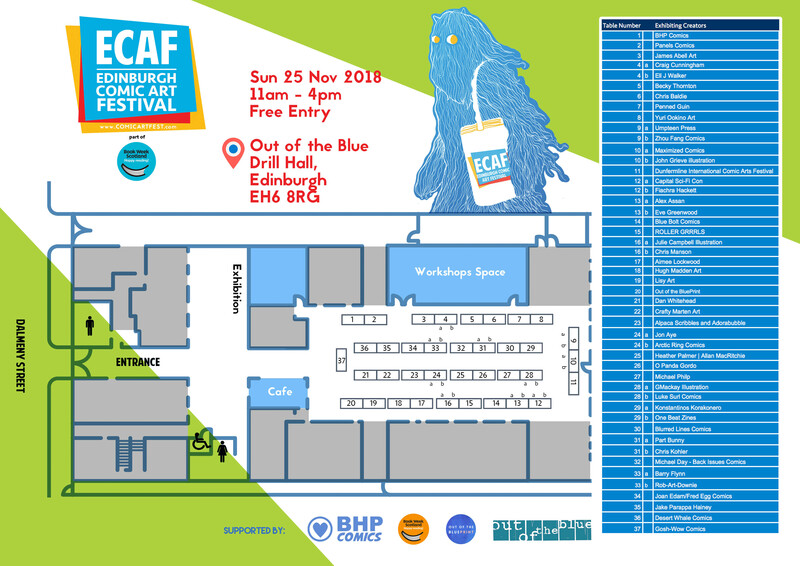 This year we’ll be hosting a a Comics Market with 60 exhibiting comic creators and a full day of FREE comics workshop programming and the Festival Bookshop.